When will Modi act? Swamy graphic courtesy Indian Express and Karti graphic courtesy New Indian Express. 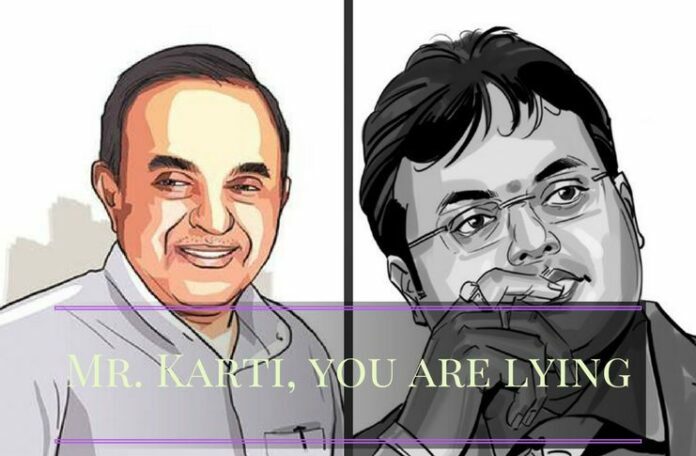 After Subramanian Swamy’s exposé of his secret 21 foreign bank accounts, Karti tweeted that he did everything legally and declared to authorities. But the fact is that Karti is telling a big lie. His affidavit to Election Commission (EC) in 2014 shows him up. In his affidavit in April 2014, Karti never declared his foreign bank accounts or his holdings in foreign companies. Any operation through these undeclared accounts amounts to Money Laundering, resulting in jail terms of three to seven years under the Prevention of Money Laundering Act (PMLA). As per the affidavit (Pages 4 to 6) to Election Commission, Karti had not declared any of his foreign bank accounts or any shares in foreign companies. He only declared his Indian bank accounts and shareholdings and investments in Indian companies. The full affidavit of Karti is published below this article and Page Nos. 4 and 6 of the affidavit details his and wife and daughter’s entire assets and liabilities. Swamy’s exposé of 21 bank accounts are secret bank accounts that Karti never declared to any authority in India. Swamy got these details from a whistleblower, working in the Income Tax Department (ITD) of the Chennai office. According to Swamy, ITD Chennai had submitted all details to Income Tax bosses in Delhi and Finance Ministry six months ago. This information about the foreign bank accounts was reported because Karti has not declared these accounts in his Election filing papers. Any operation through these undeclared accounts amounts to Money Laundering, resulting in jail terms of three to seven years under the Prevention of Money Laundering Act (PMLA). The NDA Government has given all chances to secret account holders to declare and Karti has not yet declared these 21 foreign bank accounts and hence is liable for severe punishment under Income Tax act also. Moreover, whatever illicit money Karti earned will point to his father Chidambaram who was the then Finance Minister and Home Minister and hence Prevention of Corruption Act would apply for abuse of and misuse of power too. Prime Minister Narendra Modi has to act and act now. Swamy took this call to expose Karti and his father because, Finance Minister Arun Jaitley, a friend of P Chidambaram does not seem too keen on letting the ITD and the Enforcement Directorate(ED) to act. He blamed senior Finance Ministry officials Shaktikanta Das, Arvind Subramanian and Joint Secretary – Revenue Udai Singh Kumawat in blocking Income Tax and ED officials to take action. Prime Minister Narendra Modi has to act and act now. He needs to determine if his Finance Minister Jaitley himself is the cause of this delay or if it is the Finance Ministry officials who are hushing up the findings of Income Tax. It is high time, such stalling blocks are removed from the path of law so it can move swiftly. Till date CBI has not moved an inch in Aircel-Maxis scam spearheaded by Chidambaram even after having clear proof. The ED has unearthed Karti’s massive investments in 14 countries in early 2016 and found 200,000 USD as kickback from Maxis but it is blocked from arresting Karti. Modi should order CBI, ED and Income Tax to probe into the ill-gotten wealth of Chidambaram family, one of the major looters during the corrupt UPA regime headed by the head honcho Sonia Gandhi. Next articleAmitabh Bachchan reciting Kabir’s poetry! What do you mean the “PM must act and act now”. He has been acting all along! Clear case of immediate arrest.